The Bible is more easily understood when it's told in story form. This is especially true for children. 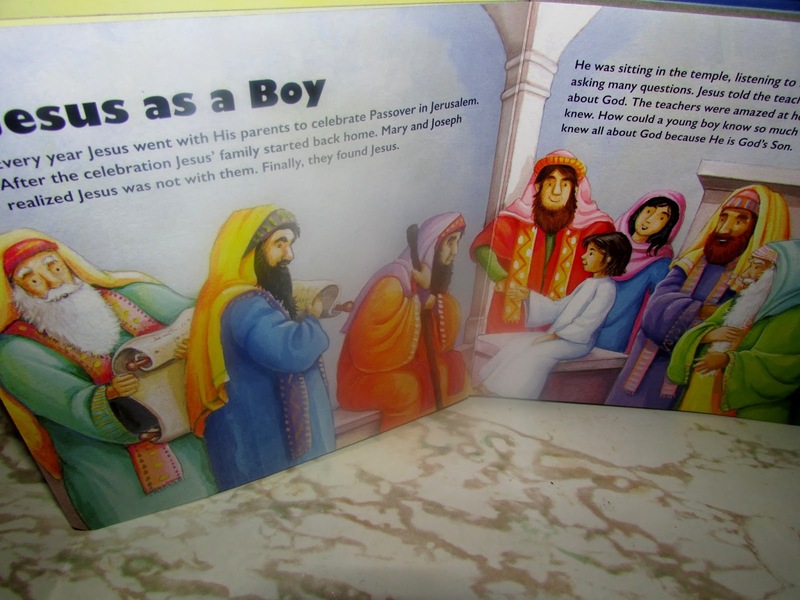 A hardcover book with colorful illustrations, My Jesus Bible is written in a format that's easy for children to understand. Different stories of the Bible are covered, but in a shortened, simple version. Each story is spread across two open pages with a title in bold. Some of the Biblical references discussed are The Last Supper, Jesus Turns Water Into Wine, and The Sermon on the Mount. Attached is a blue plastic handle for carry-along purposes. I think this book is best suited for those in the 4-8 year age range. One person will win My Jesus Bible. I love the story of Jesus turning the fish and bread into meals for thousands. My favorite person is Mary the mother of Jesus. She had a life that is unimaginable. I love to read about Moses. Ruth and Naomi is one of my favorites, along with Esther. We love the story of David and Goliath. The story of Samson and Delilah always stuck with me. My favorite story is Noah's Ark! My favorite story is the story of Jesus's birth. My favorite Bible story is Jonah and The Whale. I like the story where Jesus feeds the crowd. I love the story of Daniel in the lions' den. Moses is my favorite bible story. Noah's Ark and building things up in the face of ridicule. I love the story of Moses. We love Noah Arks because it's all about animals. i always liked the story of david and goliath. I like the story of Noah's Ark. My daughter loves hearing about all of the animals. Joseph is my favorite.... He was treated so badly and abused... But lord blessed him greatly. I love the story of Daniel being in a foreign land and yet net keeps his integrity. My favorite story from the Bible is about Jonah and the Whale. My favorite is when Jesus turned the water into wine and the abundance of fish and bread. Jesus is my favorite person in the Bible. I love the story of his birth. Thanks! I am excited that I won. Thank you so much.